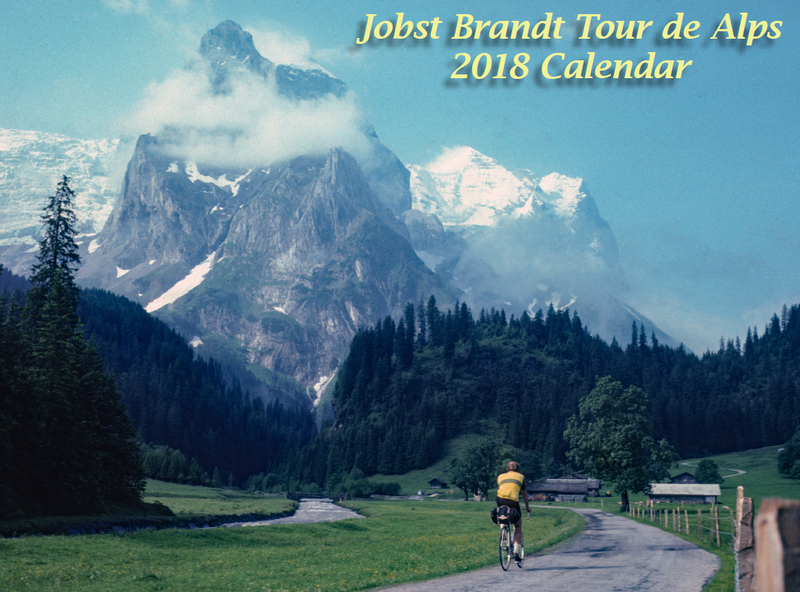 A 2018 calendar with images of Jobst Brandt’s rides through the Alps is available now. For anyone who knew of Jobst Brandt and his epic rides through the Alps, you won’t want to miss this 2018 calendar (including January 2019). It has 18 photos taken between 1960 and the late 1990s, some never before published. Others were turned into posters for sale in the Palo Alto Bicycles catalog during the 1970s-80s. All photos come from the Jobst Brandt photo collection, but obviously images of him were snapped by his ride partner at the time. The 28-page calendar (8.5 x 11) is printed on demand. Important U.S. holidays are dated. Because the calendar is sent by mail, you’ll need to give a shipping address and provide payment details to Magcloud. Cost is $7.60 (shipping not included, but runs about $5). Proceeds will help defray the considerable expense of scanning Brandt’s thousands of slides. Thanks to Richard Mlynarik for scanning the transparencies. A preview is available on the Magcloud website. This entry was posted on September 4, 2017 at 9:42 am and is filed under News. You can follow any responses to this entry through the RSS 2.0 feed. You can leave a response, or trackback from your own site.